Saturday marked the start of what Eastern Illinois radio announcer Mike Bradd terms the first of many season long trips on the OVC Turnpike. For people not associated with where EIU is exactly located, the OVC Turnpike is the stretch of road going from Exit 190 on Interstate 57 (Charleston/Mattoon exit) until you hit Paducah, Kentucky off of Interstate 24. From that 195 mile stretch of road Eastern Illinois fans, student-athletes, coaches and anyone else who fits the official and non-official traveling party can access seven of the current OVC member schools for competition. In a few short years an eighth will be added to that list as you will hit a 30-mile stretch of the turnpike from Mattoon to Effingham on your way to SIU Edwardsville. While not a long stretch it still lands on the turnpike - much like people who live off Exit 8A on the Jersey Turnpike count themselves on that piece of road even though they are miles from New York City. The two schools you don't hit on the turnpike are Eastern Kentucky and Morehead State, but that part of Kentucky can be saved for a future posting. What you learn on the turnpike is what stops are along the way and if you ride with Charleston Times Courier Sports Editor Brian Nielsen long enough, you can even find out what gas stations have the best stop-and-go food along the route. While the drive may be long, you start to decipher the trip by land marks along the way -- The Big Cross in Effingham and the Superman billboard in Metropolis. You also learn that the OVC turnpike features some of the best BBQ joints. On the way to Southeast Missouri you hit the world famous 17th Street BBQ which has won several world championship awards for its great food. (Located on the Carbondale/Marion exit - for those making the trip). In Clarksville we found a spot called Golden Rule BBQ last year which was not half bad. 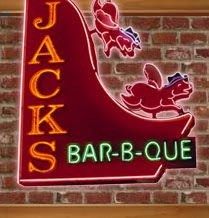 A personal favorite is located on Broadway in downtown Nashville - Jack's BBQ. You can't miss the marquee with flying pigs and its located just a few doors down from Tootsie's Orchid Lounge where EIU alum Jake Maurer plays almost nightly. The long trip to Tennessee Tech has not produced a BBQ favorite to date nor has the trip to UT Martin, but Martin has less choices than Charleston when looking for places to eat. Jacksonville State features several good choices as you would expect in the deep south of Alabama. Some of the best cornbread in the world is at Sonny's BBQ in Oxford. The one that takes the cake is probably at Murray State where the Racers sports information director Dave Winder always provides a nice BBQ spread in the press box for football and basketball which not only tastes good but is free. So the first trip down the OVC turnpike was a good one as EIU pulled out a 23-14 win in football and had a good lunch stop at 17th street BBQ. If you stop in, the pound of pork shoulder is really more than any one person should eat, but is just too good to resist.